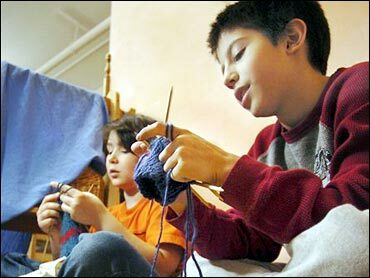 Eric Garcia and Matthew Kane are holed up in a classroom corner, chatting casually as they each knit a sock for a school project. They ponder the thought that their actions might be a little, well, unexpected. "Girls can be truckers," says 11-year-old Eric. "Yeah, girls can be truckers," echoes Matthew, who's also 11 and a fellow fifth-grader at Chicago's Waldorf School. "So why can't guys be knitters?" Fact is, a lot of guys are taking up knitting, especially as the hobby surges in popularity on college campuses, in coffee shops and at the many yarn stores that are sprouting up in cities across the country. At The Wool Tree in South Lake Tahoe, Calif., co-owner Robert Lincoln says he and his wife, Bonnie, have seen more young men coming into the store to buy knitting and crocheting supplies. Many of them are snowboarders who want to make their own winter gear - as a fashion statement or to save money to buy ski passes. "It's a little bit of a phenomenon," Robert Lincoln says. Mary-Ann Parisi says she's also had more men shopping at her store, the Knitters Niche on Chicago's North Side. She figures that as many as one in five customers are male. "I see it a lot with men who are doctors. I also see musicians and, believe it or not, stockbrokers," Parisi says. "They claim it relaxes them." Long ago, knitting was a male-dominated trade in Europe. Sailors were known to knit their own windproof sweaters for long voyages. These days, however, it's a hobby most often associated with women. The Craft Yarn Council of America, a trade organization, has no numbers on guys who knit. But its newly released survey did find that the percentage of women ages 25 to 34 who've knitted rose from 13 percent in 2002 to 33 percent last year. Mary Colucci, the council's executive director, says those figures and anecdotal accounts she's heard have led her to conclude that more men are, indeed, knitting. Toby Fee, a sophomore at the University of Oregon, is among them. He learned to knit as a way to bond with his grandmother. "I felt like I didn't know much about her," says Fee, who plans to go to medical school. "She was really excited about it." Since then, his girlfriend has encouraged him to try more complicated projects - sweaters, socks and a scarf made with very fine mohair yarn. Marcus-George Lowery, a 16-year-old Chicagoan, started knitting in kindergarten at the Waldorf School, a private institution where knitting is part of the curriculum. Now he likes making gifts for people - scarves and hats, mostly. "When I get it done, I feel good," he says. In New York, 42-year-old Tony Limuaco started knitting after the terrorist attacks of Sept. 11, 2001, because he found it soothing. Now he's selling his handmade hats in stores around town. "I have to say, I can't believe how good I am," he says, chuckling. Guys who knit in public say they often get teased or receive odd looks. But others say their knitting can be a conversation starter. Elise Goldschlag, owner of Flying Fingers knitting store in Irvington, N.Y., says her 19-year-old son, Dillon, pulls out his yarn and needles whenever he wants to meet girls at the Rhode Island School of Design, where he's a student. "I can't believe it: He's using knitting as a babe magnet," she says. Still, she says most of her male customers are pretty shy about their hobby and don't often hang out at the store for classes. Fee, the Oregon student, says many guys are uncomfortable crashing women's knitting groups. He's tried it and notes: "Sometimes, it feels like the room gets a little quiet." Increasingly, however, there are alternatives. This month, a store in Davis, Calif., called In Sheep's Clothing is hosting its first-ever knitting group for men. Dan Vera, a 37-year-old writer and editor in Washington, D.C., also has started an informal men's knitting group that meets at a coffee shop in the city's Dupont Circle neighborhood. And last fall, he launched a Web site called MenKnit.net, which offers male knitters and supportive women a forum to share advice on their latest projects - or just to vent. The site's motto: "Man Enough to Knit; Strong Enough to Purl."